Sussex-based garden designer, Naomi Ferrett-Cohen, is working with the HIV collaboration, CHERUB, at this year’s Chelsea Flower Show, to help raise awareness about young people living with HIV in the UK and beyond. Naomi’s garden will challenge stigmas and promote the message that it’s possible to live well with HIV, as well as highlighting the search for a cure through dedicated scientific research. Naomi has designed the debut garden with young people in mind, working in conjunction with the young people’s HIV charity CHIVA, which has offered advice and inspiration. 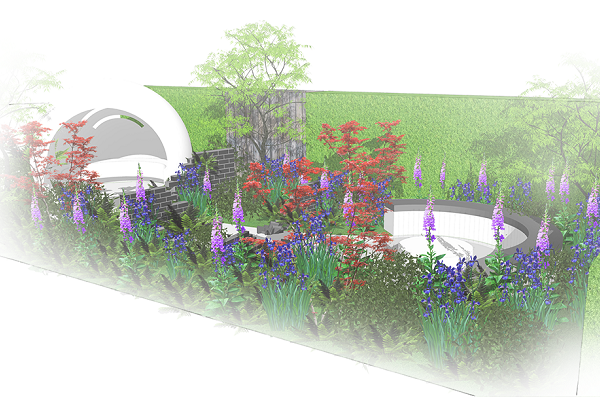 Using over 1,000 plants, the key species will include Acer Osakazuki, Acer Vitifolium, Acer Palmatum, Drimys winteri and Dicksonia antarctica, supplied by Hortus Loci Ltd, Architectural Plants and other nurseries. Other materials include composite stone for a white ‘pod’ structure, Welsh blue-grey slate and bamboo composite. Whilst clearly being a conceptual, show garden, Naomi has created a design that could still be recreated within a home garden context. The garden uses specialist planting and design to take visitors on a powerful symbolic journey, helping to promote acceptance and understanding about the condition – breaking down walls. CHERUB, affiliated with Oxford University, identified RHS Chelsea as a great opportunity to raise public awareness around HIV, a disease which affects 37 million people globally. Whilst HIV is now treatable, it remains a complex condition in childhood and particularly adolescence.